I came down with a cold this week, it is the first cold that I have had in about 4 years. I had forgotten how awful you feel when you are sick. So my post this evening is going to short and sweet. We were at our church fall festival a couple of weeks ago. They had raffles going on throughout the day; one of the prices that they were giving out was a 25 pound bag of flour (from a local flour mill). Guess who won one of the bags of flour … that right, I did. That made my day, I was so excited. With all that flour my first thing I wanted to make was a batch of bread. I love potato rolls and found a recipe that was right up my alley. 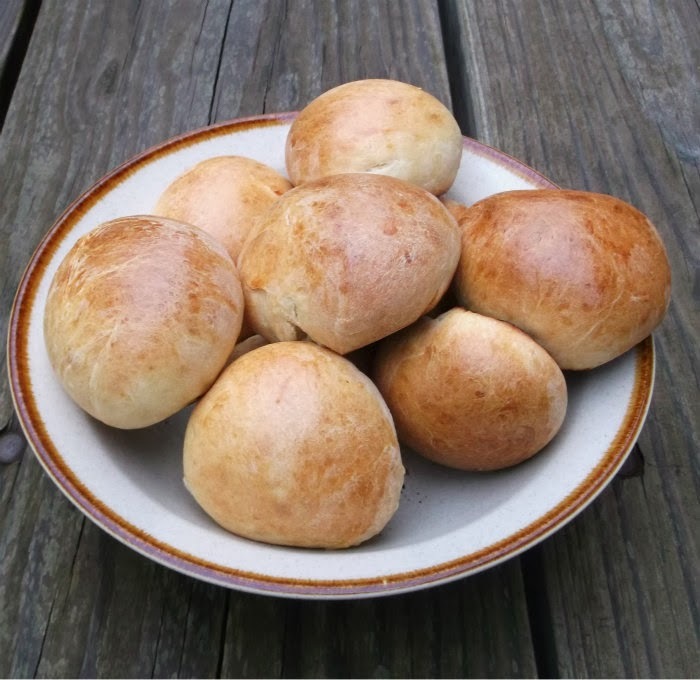 These rolls take a little longer than your normal rolls, but the bread turns out so soft and light. Plus they freeze really nice, if you don’t eat all of them after they come out of the oven. 1. In a large mixing bowl mix the warm potato water, (make sure that you save enough water from the potatoes after they are done cooking, but be sure to cool the water until warm before adding to the mixture) yeast, and sugar. Stir the ingredients together and let set for a couple of minutes. 2. Add the remaining ingredients into the bowl and mix until the dough comes together, you can use your hands at this point. Continue to knead the dough until smooth, about 5 to 6 minutes. 3. Lightly grease the bowl, turn the dough to coat both sides. Cover and set in a warm place for about 90 minutes, until the dough has doubled in size. 4. Divide the dough into 16 pieces. Take each piece of dough and take the ends and tuck under until you have a ball shaped roll, continue this method for all 16 rolls. 5. Place the balls on a lightly greased baking sheet, leaving about 2 inch between them. 6. Cover the rolls and allow rolls to rise for 2 hours, till they are quite puffy. (I cover mine with a dish towel). 7. 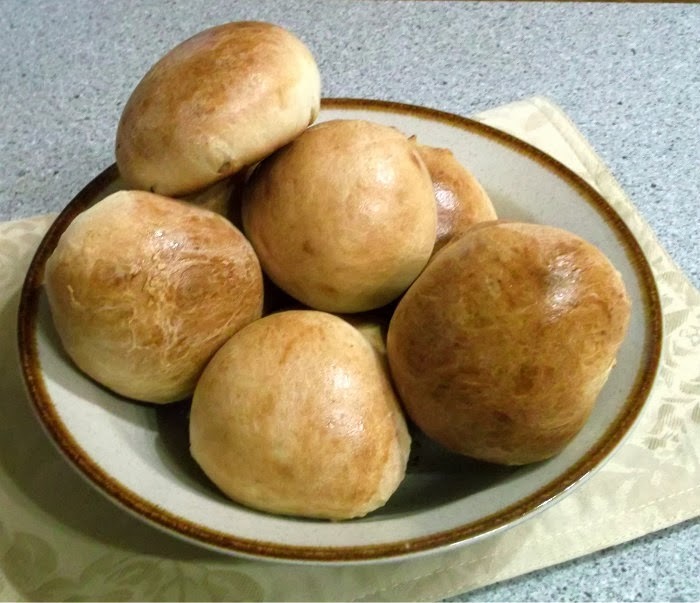 Bake rolls in a preheated 350 degree oven for 20 to 25 minutes. Yum! I am making lots of soups and stews and chilis lately and could use some new roll recipes to pair them with! Love these! I’m so sorry you’re sick, it can really get you down and wear you out. Your rolls look delicious. I applaud you for cooking when you’re sick, I don’t. So sorry you’re sick and hope you feel better soon. Being sick is the pits. Anyway, great bread! 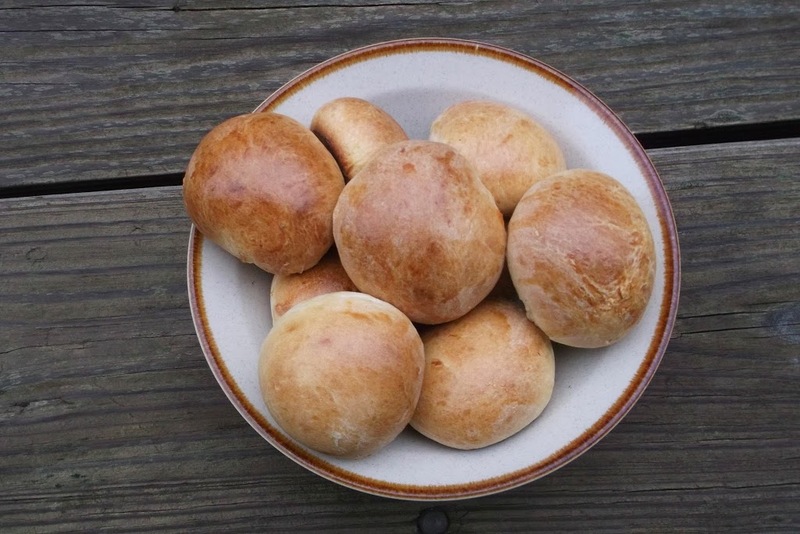 I love the flavor and texture of potato rolls and bread. This looks wonderful – thanks so much. Bookmarked. They look absolutely delicious. I hope you feel better & congrats on winning the flour!